ORANGE CITY, Florida—The pontoon boat meandered down a back channel of the St. Johns River through Blue Springs State Park, 54 kilometres north of Orlando. Alligators on the shore basked in the cool morning sun. A huge seal-like manatee slipped past our hulls, one of over two hundred wintering in the warm spring water. Captain Peter Allen pointed out birds. With his help we spotted a green heron, then a purple gallinule, and before we could fully appreciate their beauty Allen turned our eyes to wild turkeys in the trees, yellow-crowned night herons, a black, web-footed anhinga and a shy American bittern, the colour of the brown river reeds. Having recently retired, my wife Lucie and I wanted to travel more and also to evade the cold February wind. A van, similar to the one we owned and loved twenty-five years before, seemed to be the perfect solution. A week later we purchased a VW camper. 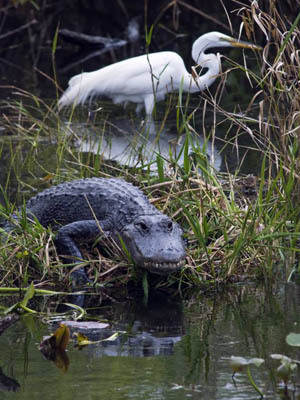 We turned our attention to the highly rated Florida State Parks. They boasted unlimited sunshine, good camping, wild life, kayaking, bicycle and hiking trails and luxuries like electricity at every campsite for an average of $32 (US$25) a night. There would be St. Augustine, the oldest permanent European settlement in continental United States, the Everglades with its salt marshes, mangrove forests, cypress swamps and Fort De Soto, a county park set on a narrow strip of land that stretches south into Tampa Bay with beaches that annually rank best in the United States. Some parks were completely booked by October. Fortunately, because our VW camper van qualified for tent sites, we found space at all but one park. Reserving sites six to eight months in advance is a must. the northern-eastern coast of Florida. We rode our bikes every morning on eight kilometres of hard packed sand beach, with Atlantic waves lapping at our wheels and the sound of seashells crunching beneath our tires. Two hours south at Anastasia State Park, we set up camp on a quiet, wooded site not far from the tidal salt marsh and sugar white sand beach. The historic town of St. Augustine (established in 1565), with its 17th century Spanish fort and old colonial streets was just 15-minutes away by bicycle. Near our campsite the brown storks and osprey were diving for fish in the bay while ibis, egrets and blue herons fished the wetlands for their next meal. This unexpected spectacle became a daily highlight. A week later we packed up the van and drove south and inland to Blue Springs State Park, where Captain Allen’s amazing river cruise fired up our enthusiasm for the natural attractions Florida offered. Moving south, after brief stays at two other state parks, we bypassed the glitz of Miami and drove to Everglades National Park, the second largest national park in the US (after Yellowstone) that covers much of the 182 kilometres from Homestead to Naples and south to the Gulf of Mexico. 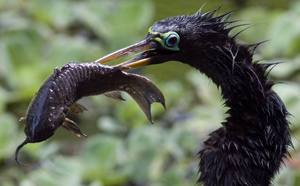 Our cameras were blazing and our excitement high as we walked the Anhinga Trail, through the scenic Everglade marshes and swamps. One camper described it, “like being at a zoo” because of the concentration of wildlife on the trail. Just outside the campgrounds at Flamingo, we watched a pair of osprey tending their young and down at the pier, three crocodiles sunning in the brackish water near the Gulf of Mexico. From the parks east gate we drove the Tamiami Trail (Hwy 41), west through the Everglades to Naples, on Florida’s Gulf coast. Just thirty-nine kilometres northeast was the Corkscrew Swamp Sanctuary, a spectacular 45 square kilometre area established in 1954 to protect one of the largest remaining stands of bald and pond cypress in North America. One guidebook described it as the “jewel of the Audubon Society holdings” because of its unique natural beauty. We walked the four-kilometre boardwalk through the spectacular old growth forest and scenic swamps that teem with wildlife, including alligators, turtles, white tailed deer, and more than 100 species of birds. To the north, near St. Petersburg, we stayed at Fort De Soto campgrounds where the fabulous beaches, bike paths and beautiful birds made for a pleasant stay before continuing north. St. Joseph Peninsula State Park, one of the best camping spots along the Gulf coast was our final Florida stop. It occupies the northern half of a narrow, L-shaped peninsula that juts out from the coast, south of Panama City. 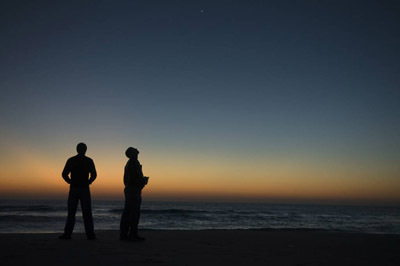 Park visitors enjoy the sunset and first stars over the Gulf of Mexico at St. Joseph Peninsula State Park near Port St. Joe, Florida on Saturday, March 7, 2009. After setting up we walked the boardwalks over the protected sand dunes, stopping to watch the nesting horned owls and the shore fishermen spread out over 14.5 kilometres of sugar white sand beaches.